Wedding season is upon us, and although weddings are always an exciting event, picking out what you are going to wear can be tedious. Not only does your dress need to make a statement, but the hairstyle you choose to pair it with can make or break your entire look. Not to worry; we’ve created a guide so that you know exactly what hairstyle to go for based on your dress so you’ll be runway ready! The ideal look is all about balance, so an asymmetrical dress should always be complemented with symmetrical hair. 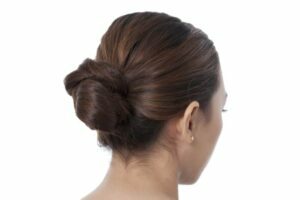 We recommend this adorable low messy bun for a subtle yet sophisticated look. Leave some pieces out of the bun to keep your look on the casual side! 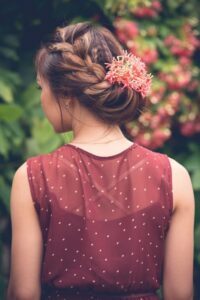 Showing a little bit of shoulder is all the rage these days, and although a little cold shoulder can be cute, incorporating long, wavy hairstyle is a must. Not a fan of having your hair in your face? Not to worry; a half-up do works for all hair; no matter the length or consistency. For example, we love this top knot look! Try using KMS Playable Texture Spray to give your waves a little more depth and a longer lifespan! A high neckline can transform a dress from drab to glam, so naturally, your hair should be glam, too! A style as sleek as this should be complemented with an exciting updo. Whether you prefer funky braids or finger waves, the possibilities for pinned-up hair are endless! Not sure what look is best for your next big event? Leave it to the experts! Bring in a picture of your dress and we’ll do the rest; make an appointment today! From a small business to a bombing business! I highly recommend that you get your hair done here. The people are so warm and welcoming and the work they do is amazing!!!! Thank you for the kind words, Gina!! Should I Cut My Hair For The Summer?